I want to know from where to get these materials,,? so whould you mind to tell me please,,? Wow this site is wonderful…..Thank you so much Nicolas. If you have any resources you recommend me to to study from,,So please tell me.. Thank you again for the link Nicolas sann. hello! i’m interested in taken those lessons too. Can you give me the link from amazon.com where can i find the books, because in kanji i don’t understand anything yet! i’m from europe, btw. Thank you very much! 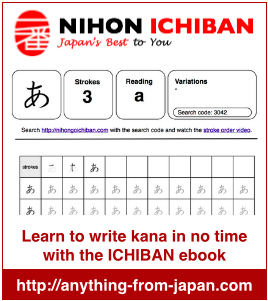 If it’s your first time learning Japanese you should start with the JLPT N5 material on Nihongo Ichiban. I just want to ask if I need to pass all the levels(N5-N2) before I can take the N1 exam? or can I just take the N1 exam? I mean is it a step by step basis? thank you so much.